King with his award from the Ohio State Bar Foundation. 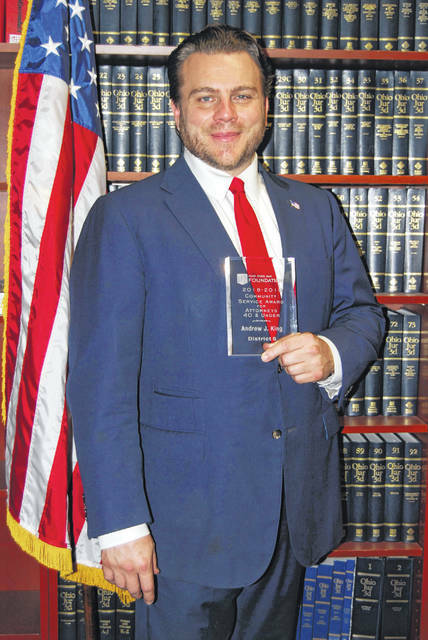 Andrew King, a prosecutor in the Civil Division of the Delaware County Prosecutor’s Office, was recently honored and given the “Community Service Award for Attorneys 40 & Under” by the Ohio State Bar Foundation. 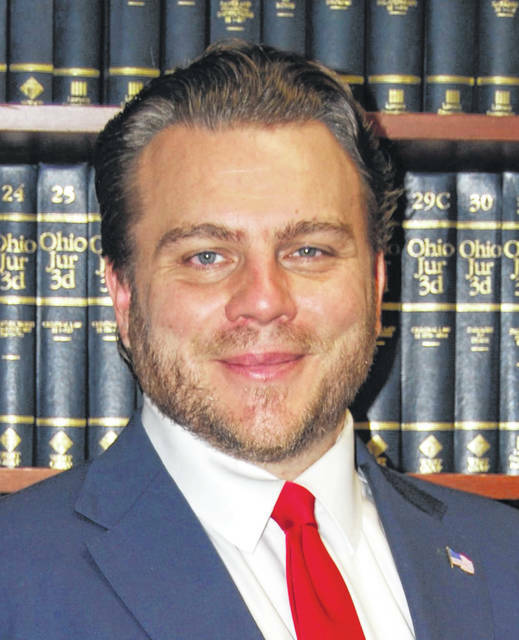 King, 40, who has been a civil division prosecutor for nearly five years, said that he was nominated by Delaware County Prosecutor Carol O’Brien, and when he found out about the award, he was humbled. King was given the award at the Ohio State Bar Foundation’s District 5 Annual Meeting Lunch at the Royal American Links in Galena on Oct. 8. As an attorney in the civil division, King gives legal advice to various government bodies in the county and townships. King said when necessary, he also represents the county and townships in litigation, and he has filled in for a few criminal proceedings. King added before he came to the Delaware County Prosecutor’s Office, he worked as a clerk for a Fourth District Court of Appeals Judge, a private attorney and a public defender. The prosecutor’s office reports that King has been involved in various volunteer opportunities, including passing out clothes and school supplies to children in need, participating in scholarship initiatives through the Elks, and being involved with his local historical society. The prosecutor’s office also reports that King has 25 years previous involvement with the Boy Scouts of America. King said his parents were both involved in public service and volunteered, and he feels the award validates that people should always try to help others.